Looking back on all of this, they might have had a point. However, times have changed as has technology and we are again seeing this movement of meal kits, meal boxes, subscription-based platforms, etc. This got the very small wheels turning in my head and made me think about the resurrection of the frozen meal category. Could it be possible? After much thought (about 10 seconds), I came to the conclusion that it could just happen if brands played their cards right and aligned their frozen meals with what consumers today are actually looking for. When you go back and look at the frozen meals that were around back in the day, most of them were extremely heavy in carbohydrates. In today’s age, that simply wouldn’t work. More and more people are looking for good quality protein in their frozen meals which have been previously overlooked. Consumers want something that is of high-quality ingredients, that tastes good, and is convenient. Everyone is busy yet they demand these characteristics. Today people are purchasing meals that come with all of the ingredients ready to go which you need to prepare yourself as well as meals that come frozen and simply need to be reheated. And these subscriptions boxes and plans are not cheap – you’re paying for the convenience of not having to go to the grocery store nor plan out the actual ingredients needed. Plus, you get the directions on how to prepare everything in the box. It’s quite simple and convenient. That being said, I feel as though brands are missing the boat when it comes to frozen meals. There are also meal prep businesses out there who prepare frozen meals and the consumer gets to purchase what they want from their website and it gets delivered to them completely frozen with dry ice. See a theme here? Frozen… Convenience… Real food ingredients… Let’s keep moving. Everyone goes to the grocery store – including those who purchase meals in a box that come delivered to their door. Yet, they still need to go buy other food and beverages for the rest of the meals they eat during the week. Brands have been getting smarter over the years and are moving into channels where they know their consumers are shopping. Look at the supplement industry over the last few years, more and more brands are putting their lines in grocery stores because as a convenience factor, it makes sense to have it there since their consumer is shopping at the location anyway. It saves the consumer time from needing to drive elsewhere to get their supplements or simply not make the purchase at all if they are forced to go out of their way. Not only that but if they don’t have their products there, a competitor can steal their customers due to an “out of sight out of mind” mentality along with the convenience factor of it being right there. How Can They Make It Work? It’s quite simple, take the model they are seeing with subscription meal boxes and create their own frozen meals again. Put the frozen meals in the freezer section of grocery stores and they are good to go. Market the heck out of it and make sure the nutritionals are clean and what the public wants and it should be a home run. Use social media and pay for Facebook ads, Instagram ads, and even consider Google ads. Get the information out there that you have a healthy frozen meal that can save you time as well as saving your waistline in the process. Cater to those who want clean and healthy meals and how are very health-conscious. Consumers are walking up and down the frozen food aisle each trip they make to the grocery store, so why not consider making frozen meals again – only this time making them healthier and with better macros? 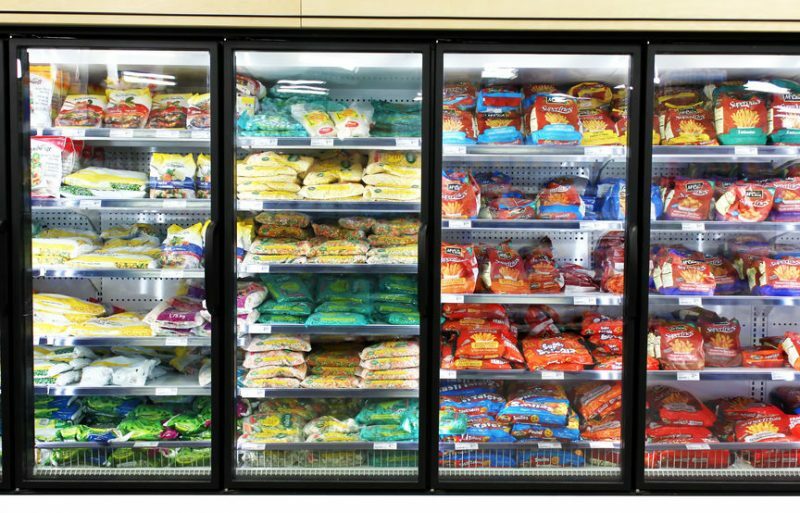 Sure, there are a ton of frozen meals on the market already, but turn the box around and look at the nutrition label – not the greatest breakdown. If brands can make the push towards real foods, such as lean protein sources with healthy vegetables and minimize all the junk they put in the meal (yes, that means the shelf life will be shorter), I think they can win. Now understand, all of those subscription meal box services will say, “But our product comes directly to your door…” True, but people are going to the grocery store too. You don’t supply enough to cause them to not go. So, if while they are there, they can purchase a similar product at a better price, you’re essentially eliminated. There are a few brands who are currently trying to make a big play in the space such as Healthy Choice, Lean Cuisine, Kashi, as well as some others. But overall, I think even those brands can improve their product. Overall, I don’t think we’ve heard the last of frozen meals. I think if the right brand launches or changes their current stance, it can completely revitalize what seems to have been a dying niche. If the profile of frozen meals were decent would I purchase them? Absolutely. Would I completely eliminate fresh food meals? No, that’s just silly. But, when I’m in a pinch, I’d absolutely utilize healthy frozen meals in my rotation by only needed to grab one from the freezer and heat it up. What do you think? Could frozen meals make a comeback? Can they change and evolve enough to have it make sense from a business standpoint and would it be something you’d purchase? Let us know in the comments. Next Next post: Alq Gurley – Could A Comeback Ever Happen?